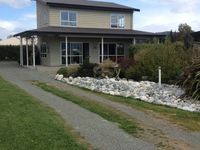 Properties in Lake Te Anau average 4.6 out of 5 stars. Property 2: Two-storey house with mountain views! Property 4: Yes you deserve this comfort, warmth and style ! Double glazed sunny and warm ! Property 5: Panoramic Fiordland Views from sunny warm rooms. Fresh Clean Linen included 😀! Property 8: Location ! Location ! 3 mins walk from bars, cafes and etc. Family friendly. Property 10: View On Worsley - Fiordland and Milford Sound! Property 49: Charming self contained house. Great house in easy distance to shops. Had every thing we needed. Thanks for letting us stay.